Sweet potato time! I love sweet potatoes any way you prepare them…except from a can. Bleck! There is a local urban farm that specializes in unique and heirloom varieties of vegetables. The typical sweet potato that is sold in the grocery store, pales in comparison to the varieties that you can find at your local farmers market which can vary with different skin colors and different flesh. 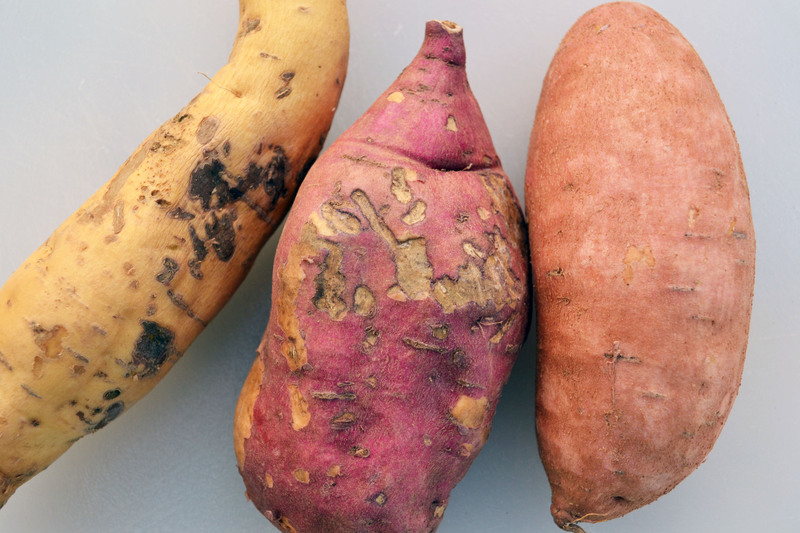 Recently, I bought three different varieties of sweet potatoes: a Japanese (red skin and white flesh…creamy, smooth, and sweet), an O’Henry (white fleshed and super sweet), and a Beauregard (orange flesh and creamy). 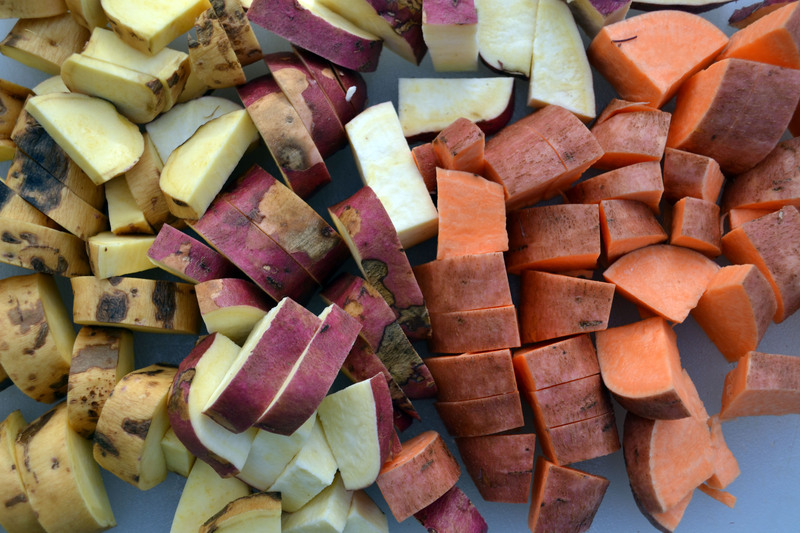 Sweet potatoes have a lot to offer nutritionally. They’re loaded with vitamin A and beta carotene, plus healthy amounts of vitamins C, B6 and E, as well as potassium. They are also a good source of fiber and complex carbohydrates. Like most vegetables, they contain no fat or cholesterol, and a medium-size sweet potato has only about 100 calories. This soup is really easy. I found the original recipe in a vegan cookbook. I had a few chicken sausages left over that I threw in for added protein. For a vegetarian or even vegan version, leave out the sausage. It’s great both ways. 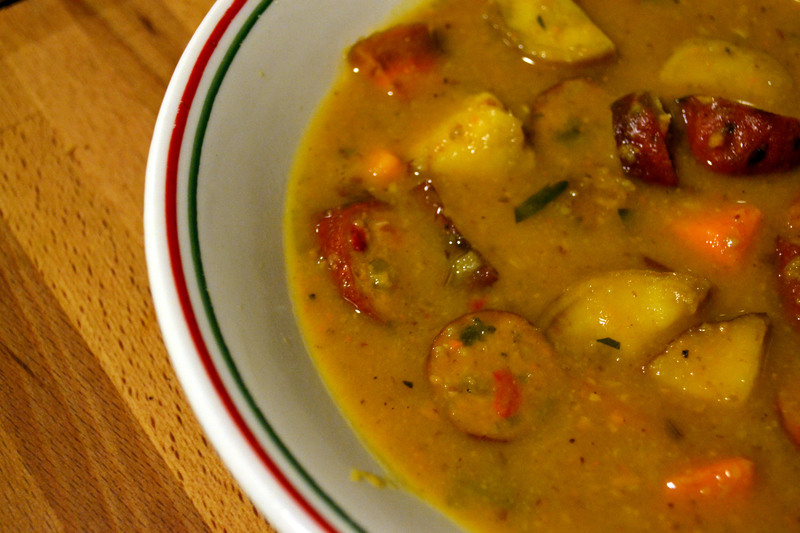 You can easily use left over sweet potatoes in this soup. Preheat oven to 450 F. Dry fry the fennel and cumin seeds in a heavy skillet or frying pan over medium heat for 3 minutes or until they start to pop, stirring frequently. Coarsely crush the roasted seeds with a mortar and pestle. Place chopped sweet potatoes, onions, apples, and sausage in a shallow roasting pan. Sprinkle the crushed seeds over the vegetables and apples. Drizzle 1 to 2 tablespoons of olive oil over the top. Stir. Roast for 25 minutes, then turn the vegetables over and roast for an additional 25 minutes. The vegetables should be tender when pierced with fork. Remove 1/4 of the vegetables and all of the sausages and set aside. Puree the remaining vegetables with chicken stock in a food processor to a smooth puree. Transfer to a saucepan. Warm the soup over a gentle heat. Now add the vegetables and chicken sausage to the soup. Add chopped parsley. Season with salt and fresh cracked pepper to taste. Now try not to eat the whole thing by yourself, like I did.